Cecil Mamiit in action during the men's championship. Blake Strode in action during the men's championship. After four days of 16 men chasing their US Open dreams at various stages of their careers at the US Open National Playoffs – Men’s Championship in Atlanta, all the men were reaching for one goal – a wild card into the US Open Qualifying Tournament and, with it, a shot at the main draw of the 2010 US Open. In the end, No. 1 seed Blake Strode, 23, of St. Louis, and No. 2 seed Cecil Mamiit, 34, of South Pasadena, Calif., were the ones left standing. Strode and Mamiit stood on Stadium Court on the final day of competition, the same court where current US Open standouts Andy Roddick, John Isner and Mardy Fish had competed during the week at the Atlanta Tennis Championships, the first Olympus US Open Series event of 2010. With the US Open’s presence felt on that court all week, both men were just two sets away from getting there. However, it wouldn’t be easy. After battling it out in three sets for nearly three hours under the lights, Strode will be US Open-bound, defeating Mamiit 2-6, 6-4, 7-6(1). Not much had separated the US Open National Playoffs finalists. Both Strode and Mamiit won five Sectional Qualifying Tournaments in the USTA Southwest and USTA Southern California events, respectively, before advancing to the US Open National Playoffs final in Atlanta. Strode lost just seven games in those five matches to Mamiit’s eight. Going into Sunday’s final, Strode had dropped 34 total games in eight matches and Mamiit had lost just 27. When seeding was made for the 16-man tournament, 35 spots in the ATP World Tour rankings divided the two finalists. Going into Sunday, it was only nine. Not much separated the players in the final either. Mamiit took charge in the first set and Strode had one break to win the second. In the last set, Strode and Mamiit were on serve through 4-4, when Strode broke on a Mamiit double fault to go up 5-4. Mamiit then broke back and the players each exchanged another set of breaks. A tiebreak was at hand and Strode stepped up to win it. Just a few key points sent Strode to the US Open. Upon winning, Strode threw his hands in the air and headed over to his cheering section to hug friends and his coach, Cameron Moore. After accepting the trophy for the title, Strode signed balls and hats of ballpersons and kids, who said they wanted to play in the US Open, too. "To win with that match, I feel great," Strode said, clutching the US Open National Playoffs trophy. "It was by far the toughest match I have had in this whole process, so I am so happy to pull it off." Strode deferred Harvard Law School in 2009 to pursue a professional tennis career, a move that paid off by winning the US Open National Playoffs – Men’s Championship. Strode grew into tennis as a member of his local NJTL chapter in Ferguson, Mo., and developed into an All-American for the University of Arkansas. He was also a two-time SEC Scholar-Athlete of the Year. Strode, currently ranked No. 522, won his first professional title last year on the USTA Pro Circuit and also competed in the 2009 US Open Qualifying Tournament. However, he lost 6-3, 6-1, in the first round, blaming nerves and a lack of preparation. Now, he is feeling more confident and has one simple focus going into Flushing – winning. Strode has already won nine straight matches to enter the US Open qualifying and would only need three more to break into the main draw. "I cannot wait for the US Open and right now, I could not be happier with the whole US Open National Playoffs concept. 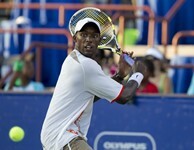 Not just because I won, but this whole week has been really great at the Atlanta Tennis Championships," Strode said. "I have been sharing the courts with the big dogs and it has been really cool. It is neat how this gave everyone and anyone a shot." Strode now has the opportunity to make the biggest leap in his developing tennis career after sweeping the US Open National Playoffs – Men’s Championship and advance to the US Open. When he arrives at the USTA Billie Jean King National Tennis Center in just one month, it is certain that the big dogs will be waiting for him again. "I am ready to bring it to them," Strode says, smiling. Be ready Andy and Roger.